Florida Gov. Rick Scott said he would be declaring a state of emergency in the Pensacola region. 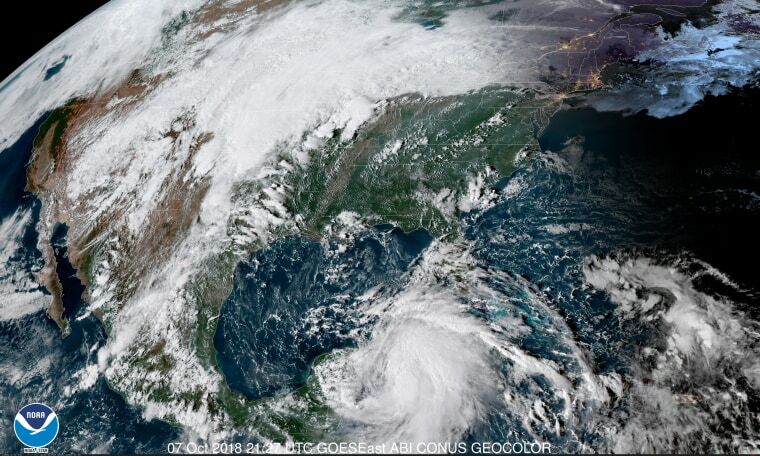 Tropical Storm Michael formed near Mexico’s Yucatan Peninsula, but it is expected to threaten Florida’s Gulf Coast as a hurricane later this week, the National Hurricane Center said Sunday. Fortier said the storm would be moving quickly, which could mitigate flooding in the Carolinas, where the floodwaters of Hurricane Florence have just receded. The National Hurricane Center forecast that Michael would become a hurricane on Monday, only two days before it is expected to reach the Gulf Coast. The hurricane center warned residents the storm could bring dangerous surges, rainfall and winds. Michael was moving north-northeast at about 3 mph Sunday but was expected to pick up speed over the next few days before striking the Gulf Coast on Wednesday. Minimum sustained winds were at about 50 mph and extended outward up to 205 miles, according to data collected by an Air Force Reserve reconnaissance aircraft. Those winds are expected to strengthen before Michael makes landfall. In anticipation of the storm, Florida Gov. Rick Scott said he would be declaring a state of emergency in the Pensacola region and activate the state’s emergency operations center. He expected to be given a full briefing on Michael’s potential impact by federal, state and local emergency management, he said in a tweet. Sen. Bill Nelson, D-Florida., said Floridians would be following the storm’s path closely. Before the storm hits the United States, Michael is expected to bring heavy rainfall and flash flooding to portions of Cuba and Mexico’s Yucatan Peninsula on Sunday and Monday. Tropical storm warnings are in effect in the two countries.